It's been almost 800 years since Saint Francis of Assisi composed most of "Laudes Creaturarum" (Praise of the Creatures), which would also come to be known later as "The Canticle of the Sun." In 1224, Francis, né Giovanni di Bernardone, was living in a cottage in San Damiano, recovering from an illness and, at that point, almost completely blind. This prayer is the realization of Saint Francis' desire to sing of God's glory, praising him for all the blessings found in nature. Sometimes also referred to as "Canticle of Brother Sun" or "Canticle of the Creatures," this prayer captures Saint Francis' love for all of God‘s creatures and peacefully acknowledges his illness as well as "Sister Death," which would embrace him a few months later. As we read through the prayer, we notice how Francis perceived a deeper connection with creation and all God's creatures, referring to them as "Brother Fire," "Brother Sun" and "Sister Moon," for example. After a year of being imprisoned during his youth, Francis abandoned a life of luxury for a life devoted to Christianity. In his 20s, he spent time at a remote mountain hideaway and in old churches in Assisi, praying, looking for answers and helping to nurse lepers. In a church in San Damiano, Francis heard the voice of Christ telling him to rebuild the Christian Church and to live a life of extreme poverty. His simplicity of life extended to ideas and deeds: "if we had any possessions we should need weapons and laws to defend them." Francis felt that nature, all God‘s creations, were part of his brotherhood. 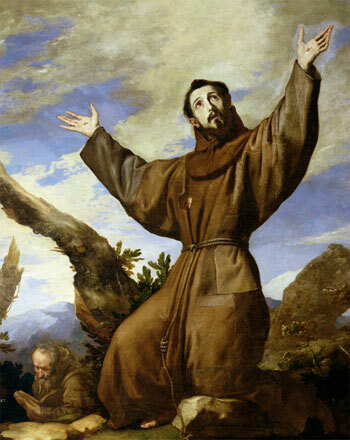 In 1979, Saint Francis of Assisi became the Patron Saint of Ecology and Animals. The many versions of "The Canticle of the Sun"
While it was written in an Umbrian-Italian dialect, "Canticle of the Sun" has been translated into dozens of languages. For centuries, composers have been creating their own versions of the prayer, looking to spread Saint Francis‘ beautiful conviction and faith. Other well-known adaptations include William Henry Draper's Easter hymn "All Creatures of Our God and King" and arrangements by Franz Liszt, Carl Off, Amy Beach and Leo Sowerby, among others. How is the prayer relevant today? On June 18, 2015, Pope Francis published his second encyclical, Laudato Si´. The title is drawn directly from the first line of Saint Francis' canticle, and Pope Francis begins his encyclical with one of the verses: "Praise be to you, my Lord, through our Sister, Mother Earth, who sustains and governs us, and who produces various fruit, with coloured flowers and herbs." Through Laudato Si', Pope Francis invites all Catholics from every country of the world to take care of our Earth, to be more conscious of "our common home" and how we, as human beings, are now accountable for it. While taking care of the environment includes appreciating all the gifts that, as Saint Francis would say, "Mother Earth" shares with us, Pope Francis also motivates us to prioritize the way we interact with nature and "to be protectors of God's handiwork." For this challenge, we can find inspiring prayers and songs (traditional and contemporary), in OCP's collection, Our Common Home. Featuring music from well-known composers like Bob Hurd, Paulist Father Ricky Manalo, Curtis Stephan and more, the collection touches on themes of care for creation, poverty and solidarity. With Pope Francis' invitation, the subject not only continues to be relevant today, but it is imperative that we reconnect with nature and become responsible stewards who care for our brothers and sisters (including our Brother Wolf, Brother Birds, Sister Water, etc.) and our Mother Earth. Motivated by this task, Dan Schutte's recent adaptation, "Canticle of Creation" offers a captivating melody, reiterating Saint Francis‘s conviction that nature itself is the mirror of God. It is now the ideal time to listen to the song and remember that creation is a gift given to us by God, which we are to use with respect and gratitude at all times.